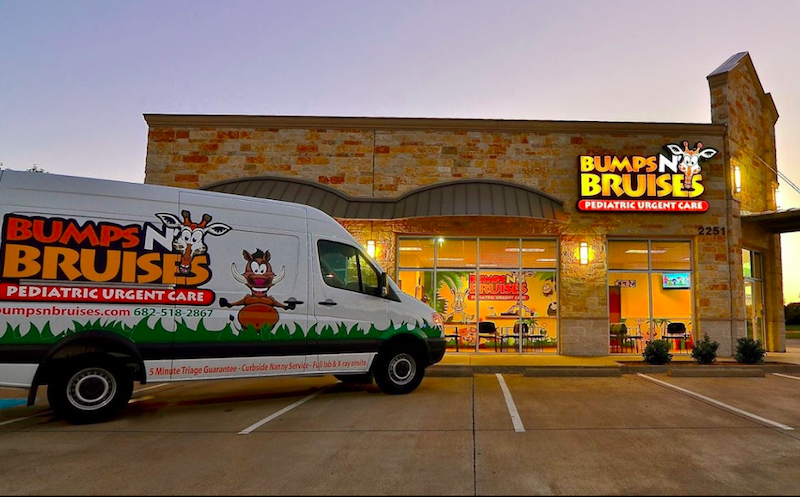 Bumps N' Bruises Pediatric Urgent Care is a pediatric urgent care center serving the children, adolescents and young adults in Mansfield with extended hours, making them a great option 7 days a week when your child's primary care office may not be open. You can find this clinic located at 2251 Matlock Rd, Suite 103 and patients can walk in to see them today from 12:00pm to 9:00pm (last verified on 2018-08-10). Recognized favorably amongst their patients, Bumps N' Bruises Pediatric Urgent Care has an average rating of 4.9 stars out of 5 based on 1480 total ratings. In fact, recent patients have frequently used words such as "ambiance" and "bedside manner" to describe their experience at the clinic. When your kiddo is not feeling well and when your regular pediatrician isn't available, you definitely want to look for positive sentiments from kids and parents who have gone before you. 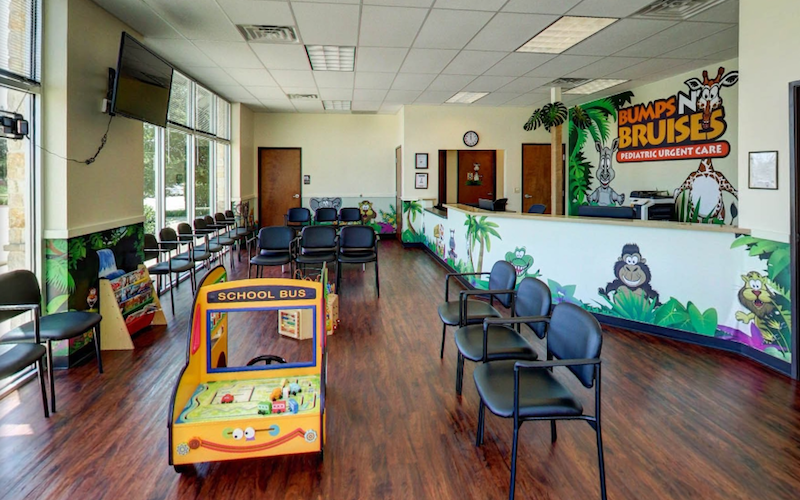 Nationally, most pediatric urgent care patients see average wait times between 15-30 minutes before being seen by a provider, which should be expected at Bumps N' Bruises Pediatric Urgent Care as well. The base price for an office visit at Bumps N' Bruises Pediatric Urgent Care is $160 with additional services being an extra charge. Patients typically pay between $20 - $160 for common services. Bumps N' Bruises Pediatric Urgent Care accepts many major insurance plans and multiple forms of payment, making it easier to get the affordable care you need. It is always a good idea to contact your insurance company before your visit to ensure the Clinic is in network for the service(s) you're seeking. Good job overall by all staff. A bit disappointed with the amount of card playing by the nurses. J/K Thank you for your quick and efficient care! Everyone was friendly and Heather the NP was very informative and pleasant. I would revisit and recommend Bumps and Bruises to my other moms. Everyone was very nice and helpful and we didn’t wait long at all. We love bumps and bruises the convince and the web checkin. Everyone is always sweet and I couldn’t imagaine any thing different bc Dr Erin Wallace is just amazing. We will go to her and support her until our lil Man is too big to go anymore! Bumps and Bruises is amazing and Ms Kate was wonderful today! Everyone was extremely welcoming and everything went very quickly. It was a great experience. Reception team was so sweet! My experience there was great I would recommend it to everyone! It took a little while to be seen, but I’m thankful for bumps and bruises being open so late so we could get our son in and get a prescription. Very thorough exam, easy online check in, reasonably priced. I will use them again. Need to decorate your rooms and make more children friendly. Not very cheerful and bright for a children’s examination room. But... the staff are great. Nothing to complain. Compare to other Urgent Cares or even some doctors I love how they listen to you and really try to get to the buttom of it and very competent doctors!